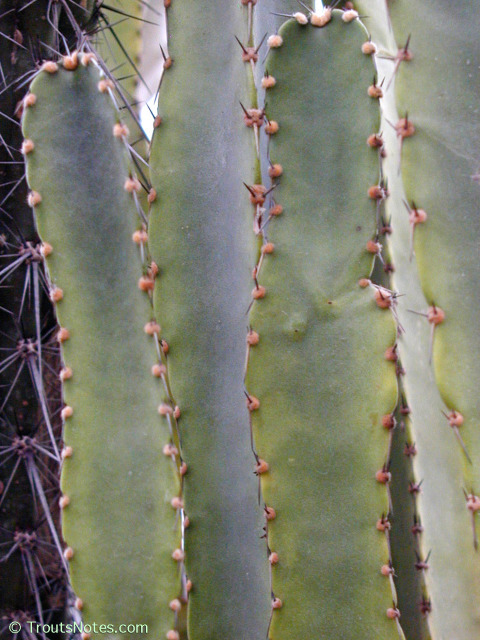 Curt Backeberg (1960) Die Cactaceae, 4: 2155, as Anisocereus gaumeri. Mescaline is present in trace amounts. Etymology: Ptero- means “wing” or “feather” (from “pteron”); Pachy- means “fat” or “thick”; Aniso- is a prefix meaning unequal, assymetrical or dissimilar. All are from the Greek. 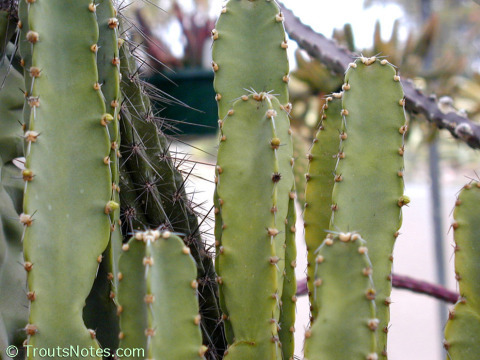 Cereus is from Latin; meaning “torch” [or “wax”]; as the earliest encountered species were candelabra-like. Distribution & occurrence: From Mexico. (Yucatan) At Hodo and east of Izamel according to Britton & Rose 1920. Does not appear to be abundant in the wild. “Plant slender, 2 to 7 meters high, erect, simple or few-branched; branches 4-angled or winged; ribs thin, 3 to 4 cm. high; areoles large, 1 to 2.5 cm. apart, brownfelted; spines several, slender, 1 to 3 cm. long, brownish; flowers yellowish green, 5 cm. long; scales of the ovary and flower-tube more or less foliaceous, drying black and thin, with brown felt in the areoles; scales on the ovary linear, puberulent; fruit not known. Erect; ribs 5 to 7, separated by broad intervals; areoles 1 cm. apart; spines about 15, 2 to 3 cm. 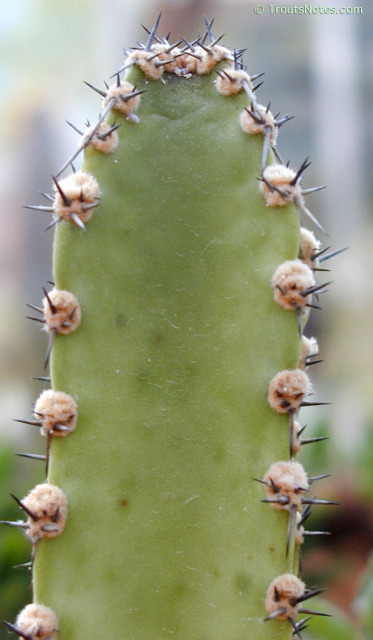 long, weak, gray in age; flower-bud acute, ovoid, covered with green imbricating scales.” pp. 71 in Britton & Rose volume 2. Slender “light pea-green” plants from 2 up to 7 meters tall. They sometimes have three ribs but may have four. The ribs are thin and around 4 cm high. The brown-felted areoles are large and 1 to 2.5 cm apart with 3 to 6 slender brownish spines that are 1 to 3 cm. long. Yellowish-green flowers are 5 cm long. Flowers in May. Fruit is 3-4 cm in diameter, turns dry and globose, small scales at base with felted axils. Scales more or less foliaceous but drying black and thin. Numerous 4 mm long brown seeds. Backeberg 1960 4: 2229-2230, pictures on pages 2229, fig. 2128 and 2227, fig. 2127, and Britton & Rose 1920 2: 71, picture in fig. 71, & 1923 4: 271. Mescaline content less than 0.01% by tlc and ms-ms.
3,4-Dimethoxyphenethylamine was indicated by tlc to be present at less than 0.01% but tandem ms estimated 0.01%. 3,5-Dimethoxy-4-hydroxyphenethylamine was estimated at 0.01% by tlc while tandem ms indicated less than 0.01%. Pterocereine was found to be the major alkaloid (0.062% by fresh weight). This is an unusual glucoalkaloid which is decomposed to glucose and the isoquinoline deglucopterocereine by the acids employed in usual extraction procedures and also by the enzyme β-glucosidase. Mohamed et al. 1979 reported an isolation of 0.164% by dry wt for deglucopterocereine. 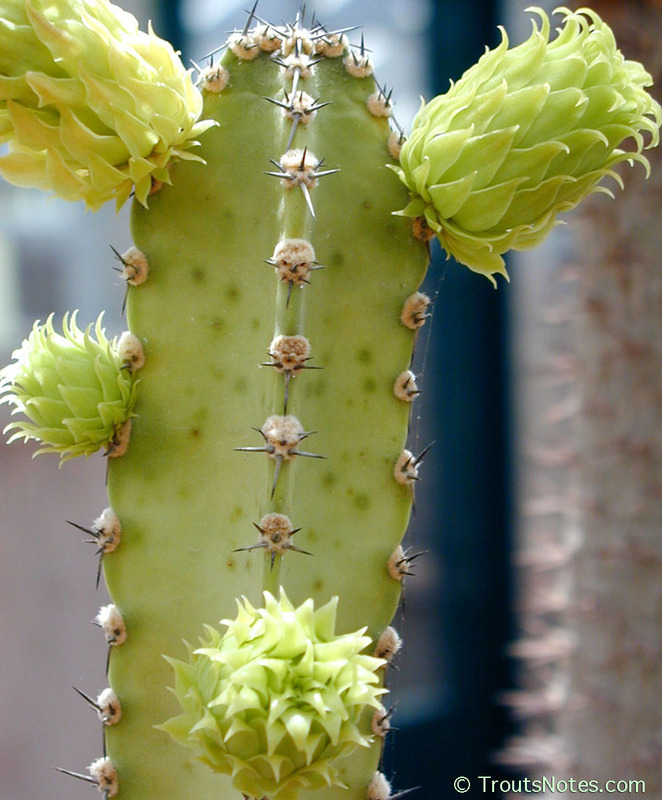 It is unusual among the cactus alkaloids not only for the glucose substituted at the 5 position (this would correspond to the 2 position of phenethylamines) but also for having a hydroxymethyl group at the one position, something only observed in calycotamine (from Calycanthus floridus). Deglucopterocereine is structurally very similar to gigantine, (found in Carnegiea gigantea), which is suspected to be hallucinogenic in animals, and also to some of the Pachycereus alkaloids, several species of which are suspected of being psychoactive. The entire area needs more work. See more comments in the Cactus Alkaloids (link to PDF), under the Gigantine entry.